WASHINGTON (CNS) — The snowy, wet concrete and throng of reporters didn’t stop Father Frank Pavone and the Rev. Patrick Mahoney from kneeling down and praying in front of the Supreme Court the morning of March 25. The snow began around 8 a.m., but it had little effect on the hundreds who rallied outside the Supreme Court in response to the justices hearing oral arguments in the Sebelius v. Hobby Lobby Stores, Inc. and Conestoga Wood Specialties Corp. v. Sebelius cases. The two key rallies stood on opposing sides. 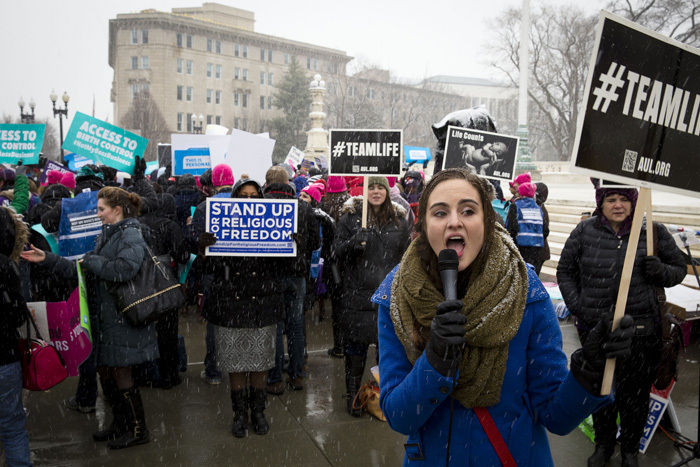 The crowd advocating for free choice in contraceptive use was nearly triple in size to its opponents and featured more than 25 speeches. Right beside them, the religious freedom rally also hosted speakers as well as a prayer vigil. The debate is over the Affordable Care Act of 2010 and its mandate that employers provide its workers health care that covers contraceptives, sterilization and some abortion-inducing drugs. The owners of Hobby Lobby and Conestoga Wood Specialties sued over the mandate, claiming they should be allowed a religious rights-based exemption from having to provide the contraceptive coverage. At the rallies, David and Susan Thompson Gaines stood on the street corner with homemade signs. They traveled from Arlington, Va., to rally before going into work. One of the arguments in the Hobby Lobby and Conestoga Wood cases is that corporations are not people and therefore do not hold religious rights. The prayer vigil led by Rev. Mahoney and Father Pavone began around 10 a.m.
Rev. Mahoney, director of the Christian Defense Coalition, welcomed people of every faith. The sign referred to surveys showing that 99 percent of sexually active women who identify themselves as Catholic say they have used artificial birth control at some point in their life in opposition to the church’s prohibition on such birth control methods. Among the speakers at the religious freedom rally was U.S. Sen. Ted Cruz, R-Texas. He referenced the Little Sisters of the Poor, a religious order that carries out a nonprofit ministry is assisting the elderly poor and has refused to provide contraceptive coverage to its employees. The order has sued over the mandate and its refusal to comply may force them to pay millions of dollars in fines to the federal government. “The idea that we’re trying to fine Catholic nuns millions of dollars to force them to violate their faith … runs utterly contrary to centuries of tradition to the protection of our Constitution,” Cruz said. Father Pavone, national director of Priests for Life, said he attended the rally not only to support for-profit businesses, like Hobby Lobby and Conestoga Wood, but also nonprofit religious organizations, like Little Sisters of the Poor and his own organization, whom the HHS mandate also affects. Priests for Life launched one of the first nonprofit lawsuits at the beginning of 2012, and on March 29, the Supreme Court will decide whether to consider the case now or wait for it to go through the entire appeals process, he said. “We believe the court will come down on the right side, both for the (nonprofit) religious groups and also for the businesses,” Father Pavone told CNS. Father Pavone said Congress seems to be on “the wrong side of this whole concept” of religious freedom. “They think religious freedom is just freedom to worship — what you do on Sunday morning,” Father Pavone said. “(But) it also has to do with what you do on Monday morning and what you do in your business decisions. When the oral arguments finished, the Rev. Rob Schenck addressed the crowd outside the court and explained some of what happened during the arguments. Rev. Schenck also said that near the end of the arguments, Donald Verrilli of the opposing side “just seemed to collapse, especially under some withering questions by … Justice (Anthony) Kennedy, with whom this decision appears to rest,” he said. The Green family, owners of Hobby Lobby, left before addressing the crowd, and both rallies ended around noon. Most likely, the Supreme Court will hand down a decision in both cases in June.